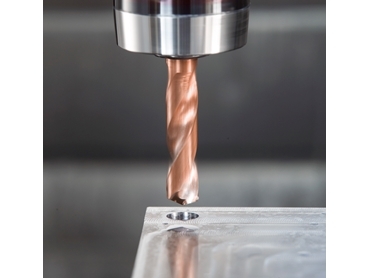 Sandvik Coromant has developed a new drill, CoroDrill Delta-C R846, for heat resistant super alloy machining in aerospace applications, such as the production of gas turbine casings. These new drills are designed for the continuous and reliable production of holes in demanding HRSA materials, which place heavy demands on the cutting edge. The geometry of the new CoroDrill Delta-C is optimised for maximum efficiency in repeat short hole drilling. The new cutting edge on the drills has a more consistent curve for added strength in the outer corners where cutting forces can be highest in demanding applications. This distributes the cutting forces evenly over the cutting edge – giving an even wear without sudden changes.The standard CoroDrill Delta-C family of drills has tools for 3 – 12 mm diameter, with a length of 3 – 5 x diameter.